I had the third Thursday of the month sewing group and the first Monday PTA meeting and the every other Saturday produce co-op. Before I knew it every day of the month was filled. Just like I was a sucker for the “every other” type of meeting, I have little control for Block of the Months. What is different? They are wonderful little packages delivered right to my door as a little gift. No other obligation! Right now I only have a couple of block of the months in the works. I missed out on Fig Tree and Co.’s BOM from last year so I was not going to let that happen again. This one is a mystery so I have no idea what it is going to be. Anticipation….. I am also doing the Austin Bluebird by Minick and Simpson. This one is a real challenge for me since I do not do the “A” word. Applique that is, but I love anything red white and blue. Lisa Bongean of Primitive Gatherings is the queen of designing BOM’s shared a bit of fantastic advise that I wanted to pass along. Lisa recommends that no matter what, cut your block out each month. When you have a few minutes to sew your pieces will all be cut and ready. I thought this was great advise and keeps your blocks from piling up. I love the freedom of quilting and there are so many ways to do each step along the way. There is no right or wrong way, just what works best for you. Do you press your seams open or to one side? and why? I've noticed a lot of new quilters are pressing all seams open, and so do I sometimes if there's going to be bulk. But as a rule I press to the side. I've read many bloggers stories lately that their quilt was put in a quilt show and on the judges comments it stated "seams should always be pressed to the side" It's the difference between an honorable mention and stealing the show. I press open when it is needed otherwise I press to the side because the warp & weft of the fabric is far denser than even a 1.0 stitch length. Pressing for me depends on thickness. Open if may seams meet, to the dark if it's just a couple of layers. I'm doing Austin Bluebird directly through M&S and love it! But I'm also a sucker for BOMs. I've thus far been able to resist the siren call of block-of-the-month clubs, but I'm not sure how much longer that strength will last! Mom has so many of them in her UFOs! Hand stitching blocks I press to one side for strength. Machine sewing if there are lots of seams-sampler quilt 6 inch blocks for instance-I press as much as I can open. My long arm quilter, Barbara, prefers open seams as she doesn't break as many needles. I also like how it feels when done as well. I was pressing seams open way back when that was a huge no-no. I pressed to the side, too, but I let the seam and the block dictate the decision. 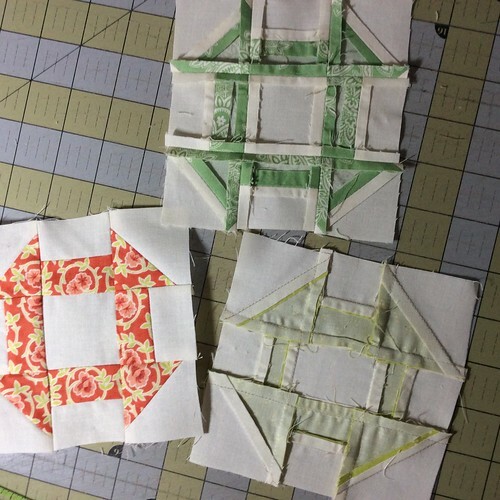 I got more than my share of hints from long arm quilters who were afraid they would split the stitches that became exposed in seams pressed open. Now I often hear that open is fine because less bulk equals fewer broken needles. So I think I'll continue to do what the seam wants. I've survived the kerfuffle so far. I press my seams to the side…I guess because that's just the way I've always done it, and because it's easier. I think pressing seams open takes forever. And, if they are open, and you hand quilt, it is harder to stitch in the ditch. Lisa B gave me that same advice one year when I did her summer Block of the Week – to always at least get the wool applique block prepped. It was very good advice! Until recently I did not press seams open. Until I made a quilt with many converging points that is! I began pressing seams open to lessen the bulk. I really like that and it also seems to looks nicer to me. I will most likely continue to press open more often now, but perhaps not exclusively. 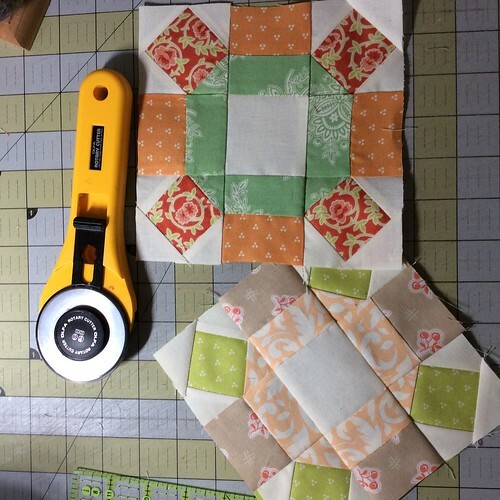 Some quilts/blocks can work well with seams pressed to side. I learned to press seams to the side (dark side when possible). There are truly times though, when growing bulk at convergences dictate pressing seams open. Would you please tell me the name of the two blocks you've shown at the beginning of this post? I would really like to use one as a center medallion for a quilt I'm making. I can imagine how it was constructed. But, I need help with the proportions to have a finished 6" center and 18" finished block. Thank you. I love BOMs! The trick is to force myself to do the blocks in the right order and hopefully before the next month's shipment arrives. I've done tons of them over the years. I'm finishing the Fig Tree Modern Building Blocks now and working on Snapshots. I will start the Fig Tree mystery soon. And seams – I press to one side as much as possible, but I'm ok with pressing open as needed. First time I did that was with the multiple seams in the Farmer's Wife blocks. Whatever works best! Very nice blocks! I press my seams to the side almost always. This will give you a stronger seam and thus a stronger quilt because the seam is relying on the strength of the fabric AND thread rather than just the thread. I did a blog post on this last year with lots of great feedback in the comments: http://thecraftyquilter.com/2014/01/lets-talk-pressing-seams-open-vs-to-the-side/ I know that complicated blocks and seams can get bulky and I will press a seam open here and there when needed.